Made from real leather, this custom travel wallet can be personalized with your photos or designs. Perfect as a gift for globe-trotting travelers, our ladies custom travel wallet is organized, featuring compartments for tickets, credit cards and bank notes. Made from beautiful Spanish leather and stitched by hand by our skilled team of artisans, our personalized ladies travel wallet is a stylish keepsake. If you're heading off on your holidays or are looking for the perfect gift idea for your friend who just loves to travel, then this leather travel wallet is a great choice for you. Upload your designs or favorite photos using our design interface and we will do the rest, printing your designs onto the leather with amazing full color in the highest quality. (When folded) 3.93" x 3.93"
(When open) 7.87" x 3.93"
I made this for my husband because he travels a lot for work. He loved the gift and feels that he is carrying home around with him as he travels. I had trouble with my picture placement but customer service was very helpful. Made from beautiful Spanish leather and stitched by hand by our skilled team of artisans, our personalized ladies travel wallet is a stylish keepsake. If you're heading off on your holidays or are looking for the perfect gift idea for your friend who just loves to travel, then this leather travel wallet is a great choice for you. Upload your designs or favorite photos using our design interface and we will do the rest, printing your designs onto the leather with amazing full color in the highest quality. Our custom travel wallet not only looks gorgeous, but it is a brilliant accessory for travelers (and shoppers) as it features several secure compartments and pockets to keep all of your important documents and cards safe. With pockets for cards and tickets and a secure zip pocket for your passport and any loose change, you will feel confident in the knowledge that your essential documents are contained safely. Oilcloth travel wallet: Our matte oilcloth fabric is completely waterproof. Easy to wipe clean, no staining. Ladies leather travel wallet: Wipe the surface with a damp cloth to clean. Avoid too much moisture. All personalized travel wallets are handmade to order by our team of expert artisans. Your photos are printed onto the chosen fabric, cut to size and hand stitched to the custom interior. Our specialist printing process binds the ink to the fabric, giving a deep, rich permanent print that won't fade. You get to customize both sides of your travel purse with either the same or completely different designs. This is so one image doesn't get worn down at the fold, potentially ruining a special photo. (It also means you get to be even more creative). For a bold design, create a photo collage using fun holiday snaps, or pictures of world famous landmarks. Simply upload and select multiple images and choose from the ready-made montage styles. Perhaps your favorite city is Paris, London, New York, Rome...the list could go on, but whatever your much-loved destination is, print your wallet with a famous landmark or legendary photograph from that place. It can be your travel inspiration and a reminder that the world is your oyster. If you're a frequent jet-setter, it's natural that you'll feel homesick from time to time, so design a family travel wallet, complete with your favorite snaps of your husband, wife or children. 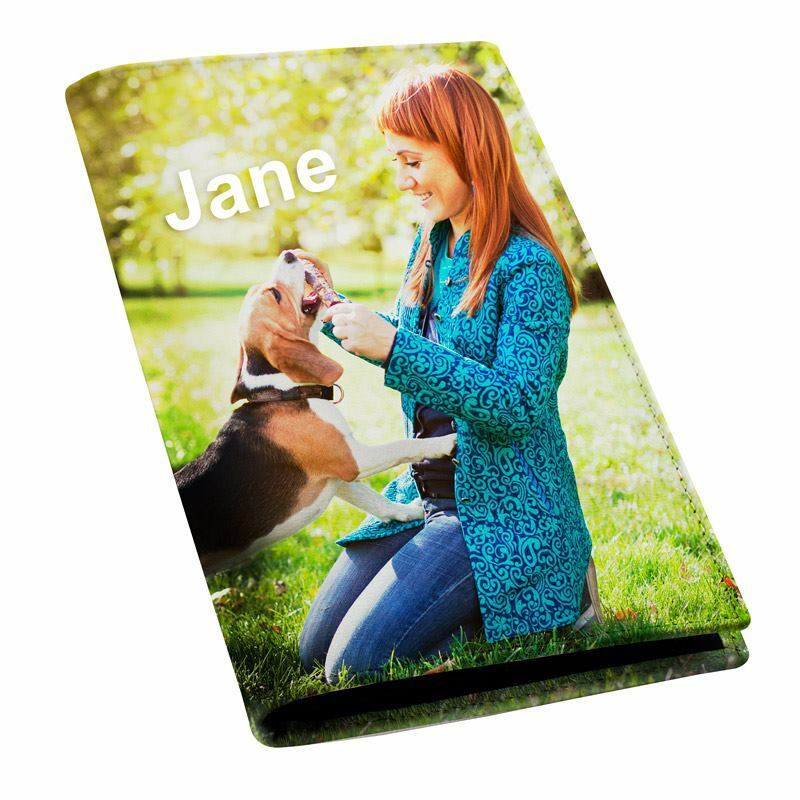 For loved ones who have a beloved pet, they miss even when out shopping, create a photo collage using the most adorable pictures so they never have to feel too far away from their furry friends. Artwork and graphic designs look great printed onto our ladies leather travel wallet. Find a colorful pattern or create one yourself for a truly bespoke one of a kind purse. What's more, it will be easy to spot should you misplace it, and it can't get confused with another document holder. A great gift for any traveler, personalized satin eye masks are available in a variety of sizes and colors.